Long, red hair, coarse like that of a bear and untamed even when braided, framed a handsome face. A thick, sun kissed skin that withstood years of dirt and wind. Eyes as bright as the the sun. 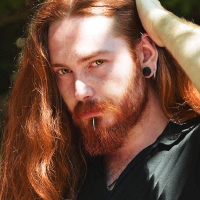 There's a rugged beauty about him, an untamed masculine appeal in broad shoulders, a muscular physique and a red beard that sometimes bears beads and braids. Sollys is a campfire. He had the potential to provide as much warmth as he can destruction. He's a man deeply in love with the world around him, in awe of the mountains he calls home and the unforgiving landscape. In the society he grew up in he finds freedom. A deep sense of purpose surrounds him, a boldness in his sense of self. To those he deems friends he is fiercely loyal and kind. Likewise to his enemies he's a passionate foe, baring shamefully little regard especially for those of lower classes. He's selfish, self centred and demands respect rather than commanding it. Having both a healthy sense of humour and a fiery temper, Sol can quickly and easily be described in one statement: a typical Inarta. Last edited by Sollys on August 24th, 2018, 10:45 am, edited 14 times in total. Last edited by Sollys on August 19th, 2018, 7:55 pm, edited 8 times in total. Last edited by Sollys on August 19th, 2018, 7:56 pm, edited 8 times in total. Kisar is a beautiful, massive male Wind Eagle. Most of his body is covered with a deep russet brown plumage with the exception of wings and tail that are outlined around the tips with feathers of slate blue. Beneath the wings, dapples of lighter golden brown speckle his primary feathers, though mostly remain hidden unless he's in flight. His beak is the usual gold, along with his feet that end in thick, black talons. Keen, ale gold eyes grace a face forged by hidden wisdom. An awe inspiring, is Kisar, as all Wind Eagles are. Kisar is as bold as the children on Ivak are. Fierce and severe, he gives no second chances and says what he thinks. Having been disappointed once he's always suspicious of new people, being particularly distrusting towards non-Inarta, but can slowly be persuaded towards friendship. He's exceedingly protective of his family, that includes his mate and her rider as well as Wind Reach and it's people as a whole, but this also means he's exceedingly proud, vengeful and often temperamental. He constantly demands Sol to prove himself worthy of his attention, sometimes even over ridiculous things, but beneath prickly sass and demanding nature, there's a true friendship between Kisar and his rider and a tender care forged by years spent together. Kisar is very much a thrill seeker. He adores to hunt, tear though harsh skies and very much encourages the same love of thrills in his rider. He's quick witted, loved a good banter and always knows best. Kisar has been bonded once before. A long long time ago he had set his eyes on a promising young Avora names Arian who had courted his attention. And it was Arian who failed him for the first and last time. For a while life was perfect for the young freshly bonded wind eagle. He had found himself a mate he adored, as strong and magnificent as Kisar himself, and his rider Arian had promised his heart in marriage to the mate's rider. Life as it should be in the Mount Skyinarta colony. But Arian was a capricious youth and he got cold feet before the wedding, deciding he'd rather leave his home, his fiance in search of a new life in far away lands and adventure it may bring. A naive, childish dream; as deemed by Kisar who, like many other eagles, had no intention of following the rider's silly ideas. Having learned that his rider was sneaking out, Kisar came to meet him, only to find another Inarta male by the name of Sollys angrily trying to persuade the man of his wrong choices. He learned of Sollys' deep care for his mate's rider, as the two had been best friends and lovers since their younger years, having been torn apart by time and circumstance. But Sol's affection for the Endal woman never faded and he was ready to fight in her honour. Seeing him as a far better candidate than Arian proved to be, Kisar killed his rider, justifying that it was 'for the best' and allowed Sollys to win his respect instead. There was a marriage. But that marriage was between Kisar's mate's Endal and his new bonded Inarta instead. Since then Kisar had seen both Inarta children and his own eggs come and go, perpetuating the inhabitants of Wind Reach. And though second time was the charm, old wounds left scars that only Sollys' patience and deep reverence for the Wind Eagle could soothe. They say she has daring eyes that look at the world around her as if she owned it all. A mossy green, they are, like the rocks of the unforgiving, strong and withstanding the test of time. Much like other Inarta, Lyanara is a pale, freckled woman with wispy dark ginger hair. Her beauty doesn't lie in her looks (although admittedly she's easy on the eyes) but truly in the way she carries herself as though she was far far prettier. She's certainly physically fit even after having gone though quite the many births and signs of age had started to show in her most notably around the lips where many laughs and smiles had imprinted their creases in her skin. Lyanara is passionate and capable. Fiercely independent she says what she thinks at all times and she thinks a mighty lot. She's the kind of woman who has an opinion about everything and everyone and when someone annoys her they won't be left ignorant to the fact. Like many Inarta she had a fiery temper and sometimes even loves a good fight to let off some steam but she seldom holds grudges for too long except in dire circumstances. Much like most people in Wind Reach, Lyanara has almost no memory of her parents. She had a fairly standard Inarta upbringing, in the Yasi caste with the rest of her peers, where she took to the bow like a fish takes to water and so, once she turned 15 she found herself lucky enough to be apprenticed by an Avora who'se speciality lay in that precise path of life. A couple years into her apprenticeship she had found herself courting one of that year's most stubborn Wind Eagles, Saakia in a bid for the Endal rank that seemed to take forever. Alas, at the end of winter just after Lyanara's 18th birthday, the two were bonded and the Inarta was to be wed to the Endal of Kisar, Saakia's mate. For a while everything seemed as if written by hands of fate. Lyanara had it all; a Wind Eagle who'se companionship she cherished, a handsome fiance and her bow in hand. But Everything changed when her fiance went missing before the wedding. By the time Lianara found out about his treasure and wish to leave Wind Reach, he'd already been dead, killed by his own Wind Eagle. Kisar had taken a new rider, Sollys, and as was customary, it was that rider she'd be wed to. And at first, in spite of her obedience, she resented him for it a little. It wasn't at all what she had planned for herself. But in time, courted like a Wind Eagle herself by the man she had known since childhood, a spark of love bloomed. Though she had never once said I love you, for over a decade, the feeling is implied. Saakia's personality is reserved and stoic. She's a very serious eagle, severe in her manner and slow to loose her temper. Though it is a certainty that if one annoys her enough to see the eagle angry, they won't live for long. She's fiercely protective of her rider, having grown almost maternally so over the years as the two grew into the roles of mothers together. But it's never overbearing, simply caring instead. Suffice to say if somebody messed with Lianara they're toying with a force to be reckoned with. Sakia is a smaller, more slender Wind Eagle with a beautiful plumage of brown and russet red with the occasional white feather gracing her head. She's an exquisite flier, fast and furious like the predator she was born to be. Last edited by Sollys on August 19th, 2018, 7:58 pm, edited 12 times in total. Last edited by Sollys on August 15th, 2018, 9:06 pm, edited 6 times in total. Last edited by Sollys on August 15th, 2018, 9:07 pm, edited 6 times in total. Last edited by Sollys on August 19th, 2018, 6:55 am, edited 4 times in total. Sollis was born and raised in Wind Reach. Having had a hardly extraordinary childhood he took to the bow very early on and gravitated naturally to the hunt as a profession as he grew older. He reached the rank of Avora by the bow alone, living in the thrill of the hunt until one fateful night he'd caught a man he barely knew sneaking out on his wedding day. His betrothed being a woman Sol had grown up with and even shared a little tender affection with. The man was an Endal and it seemed that his Wind Eagle saw Sollys as a better fit to be his rider then the trator who tried to abandon him. Taking the man's life, Sol raised to Endal rank and married the rider of his new Wind Eagle's mate. Since then Kisar, the eagle, and Sollys have been inseparable.